Voting may be old hat for some of our listeners. But for three American government classes at Sitka High School, last week was their first time at the polls. KCAW stopped by a mock election to see how student preferences lined up with the Sitka electorate-at-large. I visit Howard Wayne’s classroom the day before the election, just a few hours before the polls opened. At that point, no one knew who would win. But junior Caribeth Gundran knew the type of candidate she was voting for. “There’s a lot of people who specified that they had a financing backgrounds, which would help with Sitka’s financial issues currently with all the budgeting, especially in the schools,” Gundran said. Gundran, like are her classmates, researched the candidates before voting — listening to their statements on KCAW’s website and reading local news. The election is not an abstract idea for her. Cuts have already hit close to home. Gundran: Last year, I was in theater and they cut the theater teacher. She’s not here anymore. And they don’t have a theater class anymore either. KCAW: How has that changed your life? Gundran: Well it’s upsetting because I do a lot of technical theater and I really like it. Gundran didn’t want that part of her life to change. As for John Welsh, he looked to the future in casting his vote, favoring candidates that are paving the way for economic development. He works on a fishing boat. “I like seeing infrastructure that helps with the city, that makes money, so that fishing is not the only job that has a significant income. I’d like to see more buildings that have more people working in them that have a lot more money going through,” Welsh said. 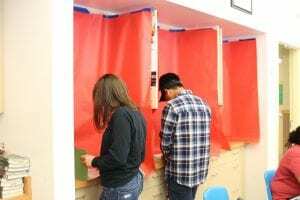 In order to vote, the students had to step behind a makeshift curtain – draped over a bookshelf – just like at the real polls. All said they felt read to vote one day. 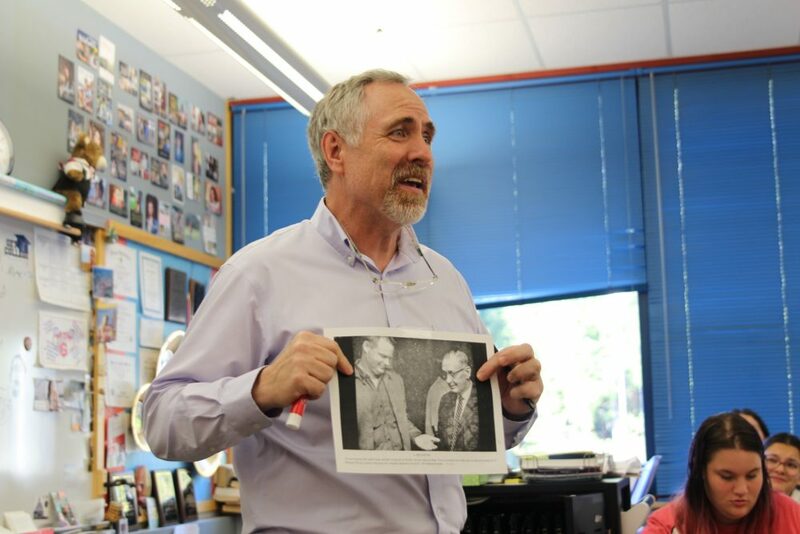 That’s one of the reasons, among many, that teacher Howard Wayne has been leading mock elections throughout his 25 years of teaching. “I don’t think that any of the issues facing Sitka are that complex that a high school student can’t understand it,” Wayne said, especially once students get a chance to talk to a parent. Over the years, he’s noticed that a correlation between how students vote and how their parents vote. The mock election has closely predicted the outcome of the real election in the past. Hovering a marker over the classroom white board, Wayne did mental math. “Let’s get tallies on this. By a significant landslide, by 2 to 1, was Mr. Paxton,” he said. Gary Paxton was elected mayor in Sitka’s 2018 municipal election and the mock election closely mirrored the reality. Eric Van Cise and Amy Morrison were elected by students to the Sitka School Board, Morrison with just one vote more than longtime incumbent Cass Pook. 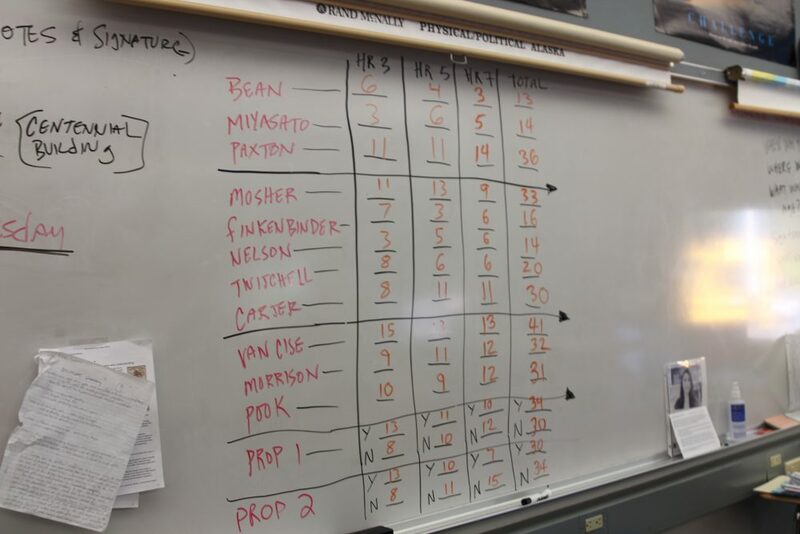 Students voted to reinstate the senior sales tax exemption and voted down a measure to exempt Sitka from the statewide smoking ban failed, just like in the real election. The only thing the mock election didn’t predict is the Assembly race. Sitka High Students elected Kevin Mosher and Brinnen Carter to the Assembly, with Blossom Twitchell as the third highest vote-getter. In the real election, the front runners were Kevin Mosher and Valerie Nelson. Tallying the students scores is someone who sat in this very classroom before. Owen Fulton took Mr. Wayne’s class in 2014. Now, he’s a student teacher. Fulton said the students can not only handle the work, but are honestly curious about how it connects to contemporary politics. “The kids show that they know a lot. I don’t know if they understand fully how much responsibility they are going to have politically after they leave high school, but they are aware that their voice will be heard…that their voice is already being heard,” Fulton said. The results of Sitka’s municipal election will be certified on Tuesday, October 9th at the 6 p.m. regular Assembly meeting. At that time, Gary Paxton, Kevin Mosher, and Valorie Nelson will be sworn in and assume their seats. Matthew Hunter, Bob Potrzuski, and Ben Miyasato will be stepping down.